The McKenley Hollow Trail is located in the 33,500 acre Big Indian Wilderness of Catskill Park. The trail is also known as the Oliverea-Mapledale Trail. This is a strenuous route some hikers use to Balsam Mountain and or Eagle Mountain for those attempting to complete the Catskill 3500 Club. The McKenley Hollow Lean To is located 0.7 miles from the trailhead. The trail is marked with red DEC markers. The trailhead parking area is located at the end of McKinley Hollow Road, off Oliverea Road south of the hamlet of Big Indian and NY 28. The GPS coordinates of the parking area is N42 04.277 W74 28.497. There is a DEC sign that marks the trailhead parking area. Look below for a description of this trail as well as a few pictures and a map. From the parking area cross McKenley Brook on a nice footbridge and enter Big Indian Wilderness. Be sure to sign the trail register. The trail follows an old woods road and you'll reach some primitive campsites prior to reaching the McKenley Hollow Lean To after 0.7 miles of hiking. The DEC signs says it's 0.4 miles to the lean to, this is incorrect. After the lean to the trail gets much steeper. Remember you are following the red DEC markers. There is a series of stone steps as the trail becomes even steeper at 1.4 miles. As the ascent becomes a bit more gradual and there is a campsite at 1.8 miles. You reach the junction of the Pine Hill-West Branch Trail at 1.9 miles. This is the end of the McKenley Hollow Trail. 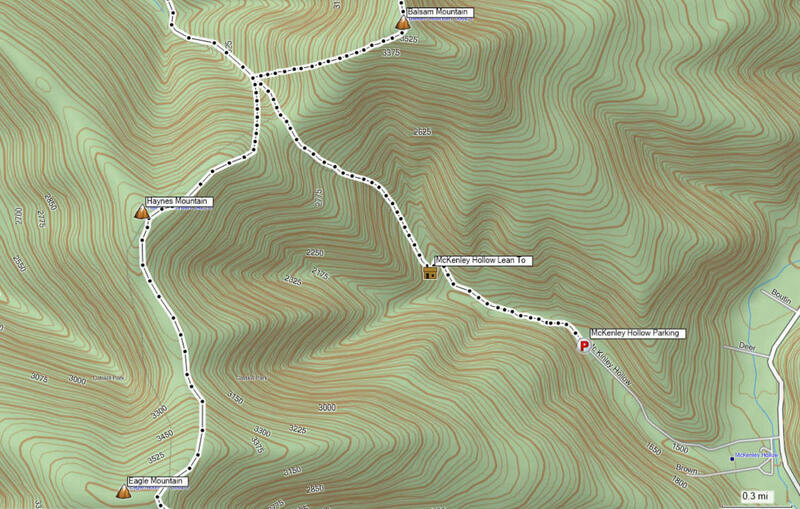 To reach Balsam Mountain, turn right and follow the trail for 0.8 miles. Turning left will take you to Haynes Mountain in 0.7 miles and then on to the spur trail to Eagle Mountain in 2.1 miles. The trail straight ahead is the Rider Hollow Trail.